My friend Melissa invited the girls and me over for lunch last Friday. It was wonderful! The table was set beautifully and the food, oh the food. I suppose pretty much anything is a step above my usual PB & honey sandwich. But this lunch was probably a million steps above that. It was a real treat. Cate gobbled up the salad. That’s really saying something when a 3-year-old will eat SALAD. Melissa was kind enough to share the recipes with me. Enjoy! Blend in food processor and chill for a couple of hours to allow flavors to marinade. For a twist, serve salsa over cream cheese and top with fresh cilantro. Cook chicken breasts for 30 minutes at 350 degrees (or in the microwave on high 4-6 mins, or until done). Cool and cut into small pieces. In a small skillet sprinkle sugar over almonds and cook over medium heat until almonds are coated and sugar has dissolved. Cool. Mix all ingredients together and top with sweet red onion dressing. 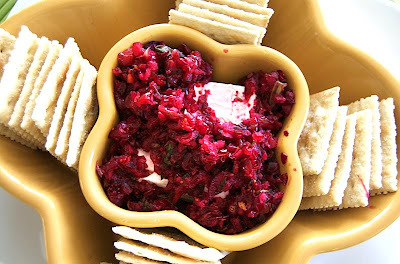 Finely chop red onion in food processor (or blender). Add sugar, dry mustard, salt and vinegar and blend until frothy. Slowly add oil. Toss with salad. We were invited to dinner this evening at someone’s home and had an amazing meal. This couple is way into food and cooking. They served a delicious vegetable soup, olive polenta with mushrooms, GOAT (yes, you heard me, goat) with veggies we’ve never eaten before, and a very fancy french dessert. Seriously, this meal was amazing. They plated all of the food, so it was beautiful, and it was fun to try completely new foods. I can promise you tonight’s menu will never show up on my weekly plan, but we so appreciated it. Thanks, Sheryl & Jason! Sadly I did not have my camera with me. So, close your eyes and just imagine what dinner would have been like. Isn’t it lovely? Sheryl & Jason participate in a fruit/veggie CSA (community-supported agriculture) and a meat CSA. Their way of cooking is pretty much opposite of mine – they don’t know what food they’re going to get each week and then they just figure out what to cook as they go along. It’s quite impressive and definitely a fresh, healthy way to eat. I am WORDY tonight. Sorry! One last thing…I didn’t cook dinner ONCE last week. It was a FANTASTIC birthday week. 🙂 So, lots of carry-overs…but this week I’m back in the game. Can’t wait to see what you’re eating for dinner this week! As always, thank you for sharing your menus! You are the best skillet a cook could have. You have a beautiful clear lid. You are the perfect shape…not too shallow, not too angled. You’ve served me well for over 9 years and I am so grateful someone gave you to me for a wedding present. My life would not have been the same without you. But it’s time I moved on. You’re not healthy for me. 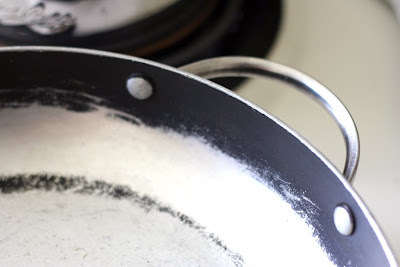 Every time I cook with you, I fear I’m turning my insides into a non-stick surface. And while my insides grow increasingly black & slippery, you, my friend, stick to everything you come into contact with. But you’ve put up a good fight. I’ve searched high and low and could not find any other skillet that could replace you. Until now. I found your perfect replacement. And it was 50% off. 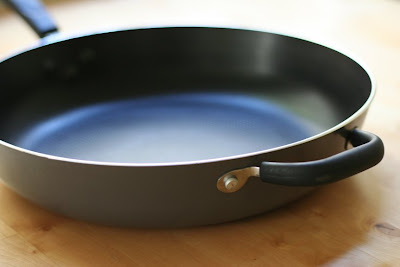 And this new skillet. Oh, it is fabulous. The food cooks so evenly and I’m not scared I’m being poisoned. What more could a girl want from her skillet? Today we are heading off to Carmel to celebrate my big 3-0. I can’t wait to get there! As a little birthday present to myself, I am leaving my computer at home and staying off-line the whole two days we’re gone. Seriously. No email. No work. No blogging. As much as I love all those things…okay, well, as much as I love blogging…I am so excited to UNPLUG. I am SO loving my subscription to Everyday Food. It’s the BEST. I made these Crispy Garlic Potatoes from the September issue. They were simple and fantastic. Just wanted to share the recipe with you! A few notes…I used a little more than 1 Tbsp of oil and I put my garlic through a press instead of mushing it with a knife. 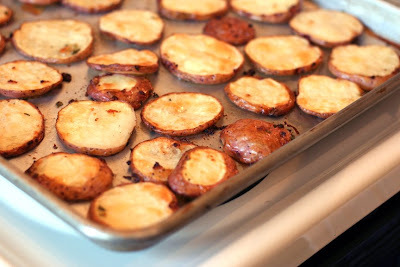 Oh, and the thinner the potato slice, the yummier they were. Oh yes I did! I bought a BOX of mac & cheese, cooked it, and ate it. Probably everyone reading this is thinking, what’s the big deal? 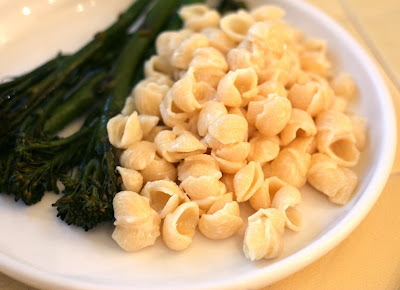 Okay, seriously, my mom never bought boxed mac & cheese growing up. Never. Honestly. And the idea of powdered, orange-colored cheese never really appealed to me that much anyway. Hence, my need for a good homemade recipe. Tonight I asked Cate what she wanted for dinner. “Mac & Cheese.” What? How does she even know what that is? Okay, fine, Mac & Cheese it is. I didn’t have time to whip up a batch of homemade..sooooo…I looked for a box. 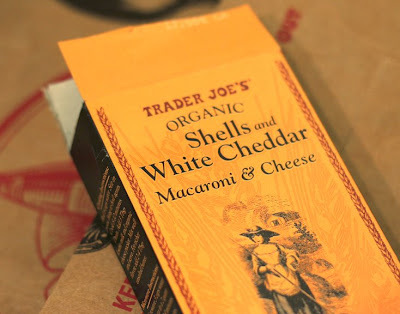 I didn’t go totally WT and get Kraft (no offense, my dear friends who love Kraft)…I bought organic Shells & White Cheddar. Anyway, it was GOOD. Surprisingly satisfying. I mean, I really enjoyed dinner. I am so excited about this week’s menu…mostly because I don’t have much to do with it! 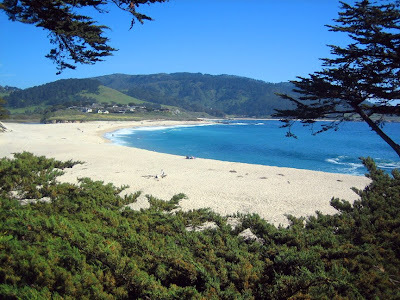 Thursday is my 30th birthday and we’re going on a little trip to Carmel, CA to celebrate. I AM SO EXCITED! Although, I’m not excited I only have 4 more days in my twenties. Remember thirtysomething? I thought they were all SO OLD. Last night I grabbed some clam chowder from Cook’s Seafood, a restaurant here in Menlo Park. It was quite yummy. And steps away from my house. Convenient, but dangerous! – Back home…but we’re going out to eat, without the girls! – Good friend in town…I’m sure we’ll eat out! Horror of horrors! My Costco doesn’t carry $5 rotisserie chickens!!!! WHAT am I supposed to do now? My go-to meal is toast. Oh, and I’ll never be able to take someone dinner again. It’s a sad, sad day. Because Costco was chickenless, I had to pick one up at Whole Foods. It was $10, smaller and a little dry. How depressing. Time to go eat some chocolate. Seriously, I think this cake could get just about anyone out of a chicken-induced depression. 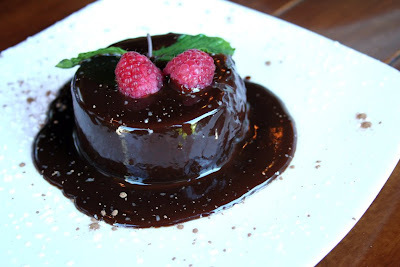 Pictured: Gooey goodness from Jake’s Del Mar. Yes, I ate the whole thing. By myself. Anyway, side dishes are pretty important and can really make or break a meal, wouldn’t you say? And it’s amazing how much better they can be with just a TINY bit more thought and effort. And I mean tiny…I’m as lazy as the next guy, so don’t be scared. 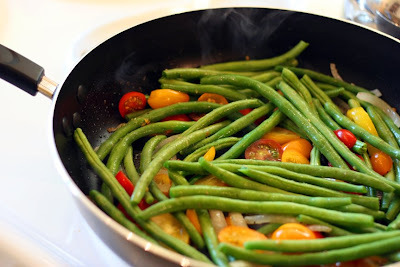 Instead of just steaming your green beans tonight, try this! Adapted from a recipe in Everyday Food, Sept 2008 (p. 80). I changed it up, and my version was quite tasty, if I do say so myself! Here’s my rendition. In a medium saucepan or large, deep skillet, melt butter and saute onion over medium heat until they begin to soften. Add green beans and tomatoes. Season. Cook until beans are done to your liking, stirring occasionally (probably around 15 minutes). Ikea has the best cheese grater I’ve ever used. And it’s only $5.99 for a pack of two. And it’s called CHARM…how appropriate. It’s certainly charmed me! Yeah, yeah, that was CHEESY. A-ha-ha-ha…. 1) Grippy thingy on the bottom holds the bowl in place while you grate, which is probably my favorite part. 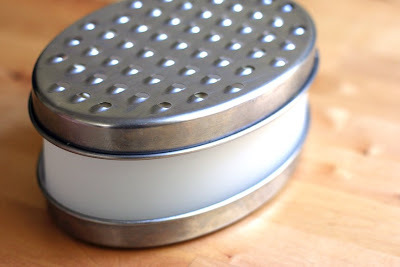 Also, the metal “grater” part fits right on top of the plastic “bowl,” so you don’t end up with a pile of cheese and making a big mess. 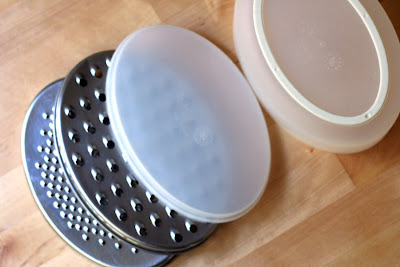 2) Comes with two different sized “graters” and a plastic lid for storage. So handy! 3) All the pieces stack well with each other (see first picture), so it’s easy to store and takes up little space. If you don’t have one, GET ONE. You’ll thank me. Also, it makes a nice gift…I gave these out to everyone I knew for Christmas one year. Happy grating!